The Achilles tendon, which connects the calf muscles to the heel bone, can withstand significant pressure from physical activities. Achilles tendinitis is estimated to account for approximately 11 percent of all running injuries, as the Achilles tendon provides the momentum to push off to walk or run. Achilles tendinitis, also called Achilles tendinopathy, results from overuse, injury or disease of the Achilles tendon, which causes the area to become inflamed. There are two types of Achilles tendinitis: Non-insertional Achilles Tendinitis - Fibers that are located in the middle portion of the tendon began to develop small tears that cause swelling and thickening. This type of tendinitis is usually found in younger people who are very active. 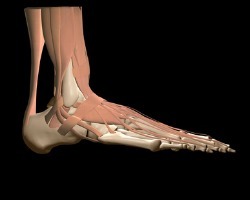 Insertional Achilles Tendinitis - Develops where the tendon attaches to the heel bone in the lower part of the heel. Extra bone growth also called bone spurs form because of this tendinitis and can affect patients at any time, even if they are not active.